What Is The Best Way To Store Your Guns? One of the most important aspects of owning any weapon, especially firearms, is knowing how to properly store it during those lengthy stretches of time when it is not in actual use. Obviously, weapons such as guns will spend a vast majority of their lifetimes in a state of storage or other form of non-usage, and any gun owner who is truly up to the impressive responsibility that comes with gun ownership should at least be aware of some methods for the safe storage of firearms. Here at the premier provider of firearms in MA or NH, we should go as far as to hope that most implement at least one of these methods as well. There are three main reasons for purchasing and utilizing some of the following storage options: preventing accidental firearm discharge, protecting a firearm from accruing physical damage, and deterring potential theft of the firearm. Any of the following firearm storage measures will accomplish at least one of these objectives in some way – while some may effectively take care of all three. The deciding factor for each individual owner will usually come down to how much they want to spend in order to ensure that their collection of firearms, to say nothing of themselves and their families/friends, are as safe as possible. Trigger locks are great for preventing accidental firing of a firearm, which should come as no surprise since that is exactly what they are designed to do. They are also pretty cheap to pick up at your favorite gun shop in MA or NH. They can’t do much to prevent damage or theft, however, which is why many gun owners use them in combination with a hard or soft sided gun case. Either type of case material is sure to help prevent a little bit of damage, such as from the gun falling to the ground accidentally, but not from severe impacts or trauma to the weapon. They also don’t do much to prevent theft, considering the cases themselves do little to make the firearms within any less portable. Strong boxes are the next step up in firearm storage, offering a level of protection which addresses all three points of concern. They can be locked, and even mounted directly to a wall, floor or table in order to maximize their efficiency, while not often becoming exorbitant in price. They are, quite simply, one step below a steel gun cabinet, which can in many ways be considered just a large strong box with slightly sturdier construction meant to store a larger quantity of firearms. They are also much more portable, (in terms of ease-of-installation), than a gun safe. Gun safes are the pinnacle of firearm storage security. Large, heavy, and incredibly theft-deterrent, there is no better way to protect your firearms from accidental discharge, damage or theft than with a gun safe. The only problems are if you can afford it, and if you have room to install something so large. It is up to you to decide which which option examined above is best suited to meeting your needs. However, should you have any questions, please feel free to visit us at Old Glory Guns & Ammo, your preferred gun shop for MA and NH customers. We have an extensive inventory of everything you need to properly store and protect your firearms. 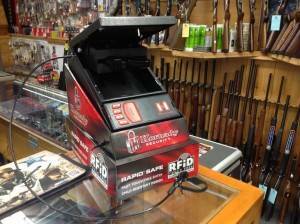 From trigger locks to an extensive line of full-size gun safes, we have it all in stock! Call us at 603-878-2854 today!